One of them, Lolek, had done quite well in school. He graduated from high school with a certificate in Biology, then attended the University of Vilna in Lithuania as well as the Sorbonne in Paris, eventually graduating as a Surgeon. Lolek had easily been the most educated of anyone in his family, and was the first to enter the medical profession before Mama Yid many decades later. Had he stayed in France, or immigrated to America, who knows what might have become of him? Instead, tragically, he returned to Poland, to work in the Jewish Hospital in Cz. He lasted most of the war in one of the labor camps in the town making munitions, but was transferred to Buchenwald in early 1945 when the Nazis liquidated them ahead of the Soviet advance. He died just a few months before Soviet liberation, and his widow died in Los Angeles a few years ago. So much promise, so much potential... a healer, a man who had devoted his life to helping people... and it hadn't mattered. 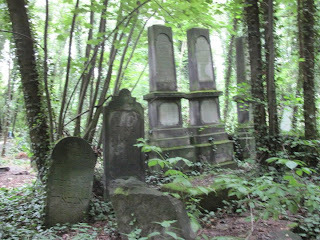 The big goal for the day was to find the Jewish cemetery and to see if we could find my great-great-great-grandfather Hirshel. GoogleMaps had made it sound like it was a straight shot once you were on the right road, but once we were driving out of town we realized it was a little more complicated than that. We drove until the road ended, in a mud slick by the outskirts of a small suburb. I checked the map. The problem was that the cemetery was in the middle of the forest, and the forest was growing between the road and the cemetery. I said it looked like we could just walk from there, but Abbot Yid wasn't interested in leaving the car in the middle of nowhere. So we got back in and tried again, this time sticking to the paved road. We took that road as far as we could until it dead-ended by an aluminum shop next to the river. According to the map the cemetery was on the other side. Abbot Yid and I got out and chatted up a worker who had come out from the shop to see what we were up to. He looked like Wilford Brimley in overalls and a trucker hat. Using my extensive Polish skills plus the fine art of pantomime, I asked if we were close to the Jewish cemetery. He nodded, and proceeded to give me a two-minute animated speech in Polish. (Since I couldn't understand a thing I just watched him for body language.) We established that the cemetery was walkable from there, and also asked if we could leave the car there. He nodded and waved cheerfully. To cross the river, we had to duck under gigantic water pipes (Pavel later explained that these pipes took water from the river and heated it to provide steam to the apartments in the city) and cross a railroad trestle. Abbot Yid remarked that only I would consider something like this a vacation. We came to a clearing and saw a young Polish man walking from the left with a wheelbarrow with some wood stacked in it. I said Dzien dobry but he ignored me and just kept walking away, whistling to himself. We followed the way he had come and after a minute the trees gave way into another clearing, this time with a stone wall. We had found the cemetery! There was a small bus by the gate and I said Dzien dobry to the driver, who responded, "Hi!" He said he was there with an Israeli tour group that was there cleaning up the cemetery. I said we were looking for a grave. A number of years ago I had the good fortune to find part of the cemetery data online. It had been recorded by a researcher from Israel named Binyamin. He had the grave number and even a picture of Tzvi Hirsch's grave. I had been amazed and excited-- though this diminished slightly after I showed the picture to a friend and he pointed out that I had been holding it sideways the whole time and that the tombstone was on its side. I had printed out a picture of the tombstone along with a map of the cemetery. I figured since we had the number of the stone and we knew what it looked like, it couldn't be all that hard. The driver pointed us in the approximate area where it might be, and went back to his bus. "Good luck," he said doubtfully. As soon as he left us, I realized what he had meant. 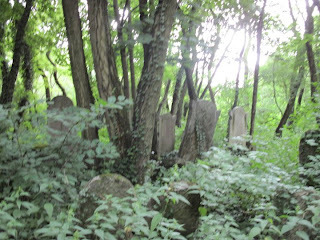 I had been in cemeteries in New York and they were challenging to walk through, but it was nothing like this. 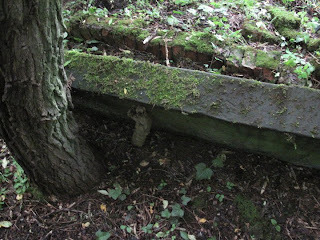 The forest had literally taken over the grounds. In places the trees were so dense you could barely see the sky. Still, I started hunting. 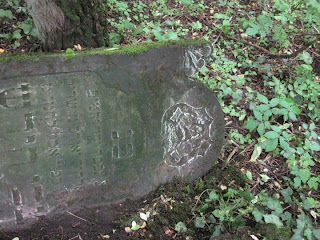 I knew we were looking for a distinctive grave that had a round top but pointy side-corners, with a three-petaled flower on the side. And we had the grave number, that would help, right? As we started looking, though, I started feeling a small pit in my stomach. There were no numbers on any of the stones. Only about a third were left standing. The others were jutting out at impossible angles from the ground, if they weren't lying face down and being grown over by weeds and grass. It looked like a hurricane had whipped through the place. There weren't even any paths. You could only get from one place to another by walking on the toppled stones. Every step I took, I was either stepping on someone's tombstone or their grave itself. It wasn't creepy as much as sad-- that this was all that was left. Mama Yid's family were Kohanim, so I tried to look for Kohan hands extended in Vulcan-salute. But even then, I realized there was no way this was going to work. 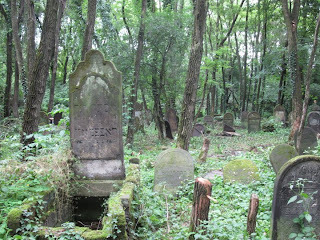 There were just too many graves, and too much forest. The pointy-cornered stone was not much help-- the style had been a popular choice, as had the three-petaled flower. We found some Kohanim, but none were inside the distinctive shape-- curved but with corners, almost like a policeman's badge-- that was on Hirshel's stone. "I didn't realize it would be so hard," I said. I felt embarrassed. We had come so far to do this, and I hadn't had any sort of plan for finding the grave! I just thought it would happen. It had been stupid of me. "You'd need a miracle to find him here." Mama Yid said she was going to ask the students for help. I was resistant, at first. It sounded like some of them were speaking Polish. Maybe the Israelis were working with local Poles? But in any case, it was good they were cleaning up the place, but that didn't mean they could help me find a grave. And if the Polish kids couldn't even read Hebrew, how could they even know what was there? It was hopeless. Part of this was also that I felt embarrassed that we couldn't find it ourselves and that I hadn't thought about how hard it might be. I was also a little nervous about talking to the Israelis. What if they didn't want to help? Still, Mama Yid went and asked. We went up to a student and said hello. They weren't super confident in English so they went and got their teacher, Dina. She was in her early 50s and was direct and brash in a way that made her both slightly intimidating as well as immediately likable. She said they were from a high school in Jerusalem and had been coming to Poland to clean up cemeteries and to archive the data. My ears perked up. 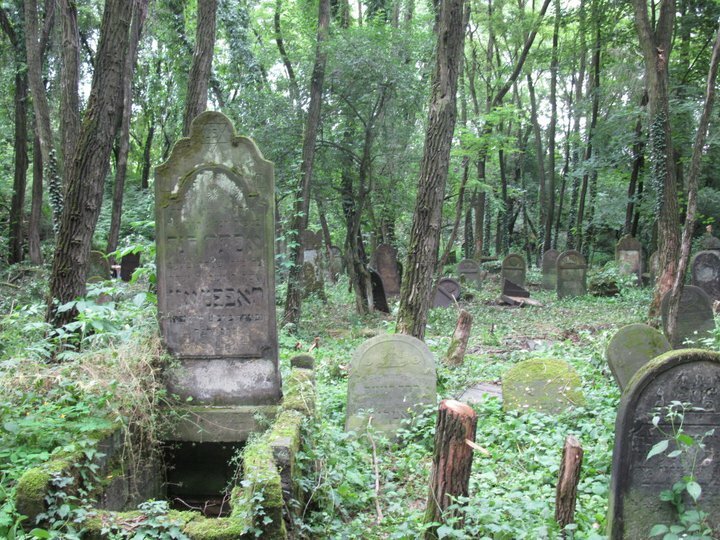 I told her we were looking for a grave that had been catalogued by Binyamin years earlier. She sighed. "He had no system. You'll never find it that way. No chance. But, if you're lucky, we might have already documented it. Let me get my laptop." As she fired it up, Abbot Yid said this was an incredible coincidence. Dina shot back immediately, "I don't believe in coincidences." As we made some small talk I mentioned my involvement with different genealogy organizations focusing on the Cz area. Dina nodded. "Yeah, I have some problems with them. Then again, they have some problems with me. They charge people to look at cemetery data, and I think that's wrong. 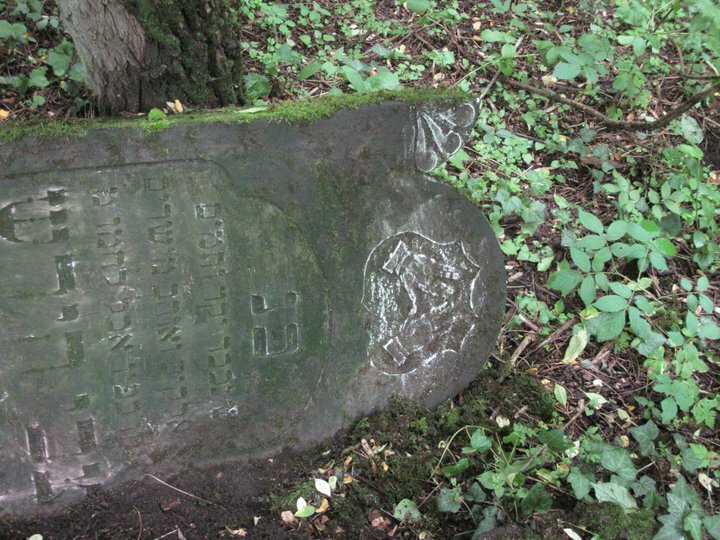 How it a 90-year-old lady looking for her family's tombstones supposed to pay that? So I do the same work and give it away free, and they don't like that very much." She also had some harsh words for the landsmanschaft organizations. "I've asked them for donations-- this whole project is all run on donations. The kids raise money in Israel to get here. This is their break before they go into the army, this is what they want to do. And so when someone tells me they'll give me 50,000 dollars, and then I call them ten times and never hear from them again, yeah, it's frustrating. I'd rather they give $100 and follow through on it." I made a mental note to send her a check when all this was over. Dina asked me to repeat the name and found a match. "I've got him." She read off a plot and grave number. "He's in the Kohen section." We followed her back to where we started, but this time went much further left from the main path. As we walked I stayed close to her with my parents following behind. She told me more about Binyamin and his methods. "He just started from the front and numbered every stone he saw. There was no organization. Before he died he gave me his blessing to continue his work, but this time in a systematic way, so future generations could come back and find them again." Dina started walking into the tall grass. She hunted for a while and then came back. "There's no way we're getting in there. It's just too dense. But that also makes me think it's not the right spot. If I have him recorded on my computer then it has to be an area that we catalogued a few years ago." She and I retraced our steps a little and then tried branching off again. I felt my whole body clench. The thought that after all this we still might not find him was too much to think about. We had to see him. I had to see him. Dina stopped by a stone. She and I were far ahead of my parents now. "What number did you have on that picture?" "Well I have 703 here." I perked up. "So it should be nearby, right?" As always, she wouldn't give an inch. "Maybe. With Binyamin, who knows?" We searched near 703-- there was one grave to the right and another to the left, but both were too small to be Hirshel's. I again began to wonder if we would ever find the grave. I tried to stay positive without getting my hopes up. We had come from the left, so I decided to take another look to the right. The trees were very dense there, so low I had to crouch. The ground was covered in brambles and thorns. On my right there was grass taller than me. I kept trudging. Out of the corner of my eye I saw a shape-- a stone lying on its side. With a corner. The stone was leaning against a tree, just like in my picture. Somehow, I knew it-- I knew that this was Hirshel. Waiting for us. "I think I found it!" I ran over, ducking under trees, hopping over roots. I could only see the back of the stone. I was totally focused on getting to the other side. Nothing else mattered now-- not the trees, not the mosquitoes, not the cloudy sky above us. I came around the side of the stone and scanned it: the left corner with the small three-petaled flower we had seen on so many others; the angle of the stone against the tree; the symbol of the Kohanim with the fingers arranged into a V-- but unlike all the others, placed into a spiky sideways oval, like a policeman's badge. Despite some lessons with a tutor, my Hebrew was still extremely basic, but I could sight-read enough to confirm the inscription: "Tzvi Hirsh ben Meir Hakohen." My ancestor. "I found him!" They all came running. Dina read off the tombstone and confirmed it. We had him. 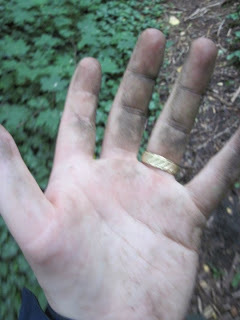 I got to work scraping off the moss with a wireless card we had gotten from the airport. Dina had said I should have the honor of the mitzvah. It took about thirty minutes. My parents made small talk with Dina but I stayed totally focused. I scraped and scraped and when the card couldn't do any more, I used my hand, rubbing the sandstone until my fingers were raw As a finishing touch, Dina gave me some chalk to rub on the inscription, making the iconography and lettering pop out. I stood there with the stone, speechless. Dina said she had to get back to her students but that they would be there if I wanted to say Kaddish. I nodded and said we would meet them back at the gate. Abbot Yid asked me how I felt and I honestly there were no words. I had gone from such highs to lows and then back again that I was totally overwhelmed. There had been times that I thought it was hopeless and impossible, that I would never get to Poland, never make it to Czestochowa, never cajole my parents to coming to the cemetery, never find the stone. And yet, now, amazingly, we were here, with Hirshel. Exactly where we needed to be. It was seemed so hard, and yet now it was incredibly simple. I ran my fingers along the edges, feeling the chisel marks on the edge. Hirshel was the only one from my mother's family with a grave. The only physical proof that her family had lived on this soil, in this place, for over one hundred and fifty years. He couldn't bring any of them back, of course. Not the ancestors who died long before the war or the relatives who had been murdered during it. But he could testify to their history. They had existed. That had been there. They had lived, right there. A legacy people had tried so hard to erase from the earth, so fragmented and limited, but here he was, right in front of me. My roots, brought to life. I wanted to say Kaddish for him right there, as a personal link between us. But the words wouldn't come. I leafed through the bentscher I had brought from home but it wasn't in there. I stood there and tried over and over, "Yitbarach v'yishtabach...", but couldn't continue. I was ashamed at my ignorance. We had come so far and achieved so much, but this simple act of saying Kaddish for my ancestor at his grave was something I didn't have the tools to do. I wanted so much to honor my ancestors and their heritage, was respected (if only begrudgingly) by the rest of the family for being "so Jewish" but was still lacking basic Jewish literacy. What would Hirshel think of me, a descendant so ignorant he couldn't even say Kaddish for him? For the first time, I felt like crying. Not for Hirshel, but for myself. My parents tried to make me feel better, pointing out that it would still be respectful to say Kaddish at the gates. I nodded. Before we left, I said the only thing I could: the Shehecheyanu: "Baruch Atah Adonai Eloheinu Melech Ha Olam, Shehechayanu, V'Kiyimanu, V'Higianu Lazman Hazeh." Blessed are You Adonai our God, King of the Universe, who has granted us life, sustained us and enabled us to reach this moment. We walked back to the gate. The kids were gone, back working with the Polish men, who were collecting the chopped trees to take back to their homes for firewood. Yet when Dina called them back, they all appeared out fo the forest, like mythical creatures conjured up; Jews sprouting from the stones and trees to make a minyan, to do one more mitzvah, to try to make things a little better in the world. Dina gave me a yarzeit candle. I lit it while she opened her prayer book and her kids made a wide circle. She handed me the book. "I can't read it," I whispered, too embarrassed to look her students in the eyes. "I'll lead and you follow," she said, without a trace of judgment. That was exactly what we did, line by line, in the minyan of young Israelis, my middle-aged American parents, and one old Catholic Pole. Though I had wanted so much to say it alone, it also felt right to do it this way. In a minyan, as part of a community. The way Kaddish is supposed to be said. We finished and I was so choked up I could barely speak. My embarrassment of my lack of Hebrew, my apprehension of being judged, all of it was gone. All that had mattered in that moment was the idea of family, of doing the decent and kind thing. It was incredibly powerful. "Thank you," I said, wishing desperately I knew how to say the words in Hebrew. The kids nodded, as if it had been nothing and went back to work, doing on last mitzvah for those who could never say thank you. We walked back with the students, some of whom were making a film for their class. Dina said they'd like to talk with us on camera. She remarked, "Just yesterday they were asking if anyone really cares about this stuff, if it really matters to anyone. And I told them, every trip, there's always someone who shows up looking for someone. They didn't believe me, but now it happened to them." While the kids were setting up their shot, Dina explained their itinerary. "This is our last day here. Tomorrow we head to Lodz for Shabbat." I felt goosebumps popping all over my neck. Earlier that morning, when it had looked like it might rain, we had talked about going shopping that day and saving the cemetery for tomorrow. If we hadn't been there that day, they would have been gone, and I was sure now that we would never have found the grave. We spoke on camera a little: I told them, "My mother's grandfather was from Czestochowa and his grandfather and namesake is buried here. What you have done for us-- what you're doing here-- is incredible." Before we left, Dina mentioned that were just five days away from Hirshel's yarzeit. One hundred and thirty-four years and we happened to come right before the anniversary of his death. We weren't the kind of epople who believed in fate of coincidence, but as Dina said, "Sometimes the separation between their world and ours is not so big." As we left, we told Dina they had friends in San Francisco and that we would try to do what we could to help them continue their work. We couldn't explain what had happened, exactly. It wasn't logical. But someone or something had wanted us to find Hirshel's grave that day, and it happened. The rest of the afternoon was relatively uneventful. One thing we did was find the monument at the Umschagplatz-- the site where the city's Jews had been deported to Treblinka. We drove until we found a spot near the end of town by the river and train tracks. The monument had been designed by a survivor from the city and paid for by the global Landsmanschaft. It consisted of a massive brick wall, with a large star of David on one side and a set of train tracks on the other, both made of iron. A giant crack broke the wall in two, symbolizing the destruction and trauma of the Holocaust. The plaques below, in Polish, English, Hebrew and Yiddish, spoke of the deaths of the 40,000 Jews of the city and concluded with, "Their memory be honored!" I thought it was interesting that the plaque spoke of singular, communal memory, and that it was not phrased as a request, but a command, or perhaps, a commandment? (It made me think of Fackenheim's '614th commandment'- "Do not give Hitler posthumous victories.") Before we left, I had Abbot Yid take a picture of me at the monument. I stood right in the gap, one hand on each side, bridging the divide, re-establishing the connection. Yes, the break had happened, and we could never go back. Things could never be like they had been before (isn't that always the way of history? ), and in some ways, that was a good thing. But to use the break as a rationale to shun the past, to denigrate our history and our ancestors along with it, was a mistake. If enough people took the time and made the effort, like me, like Dina, and even like my parents, we could be a bridge, a conduit between the Old the New Worlds, between the past and future. That was what my work in genealogy, and really the whole trip, was about. We were supposed to spend time with Pavel and his family that afternoon, but after an emotional day we were all feeling drained. We had Polish-style spaghetti and meat sauce for dinner and went to bed early, exhausted. We all felt like we had been in a movie or something. The day had been incredibly powerful. We had started that morning optimistic and naive, not realizing how daunting the task would be. Then, faced with the reality of what we were trying to do, we had needed a miracle, and somehow, incredibly, we had gotten one. What else could we say. 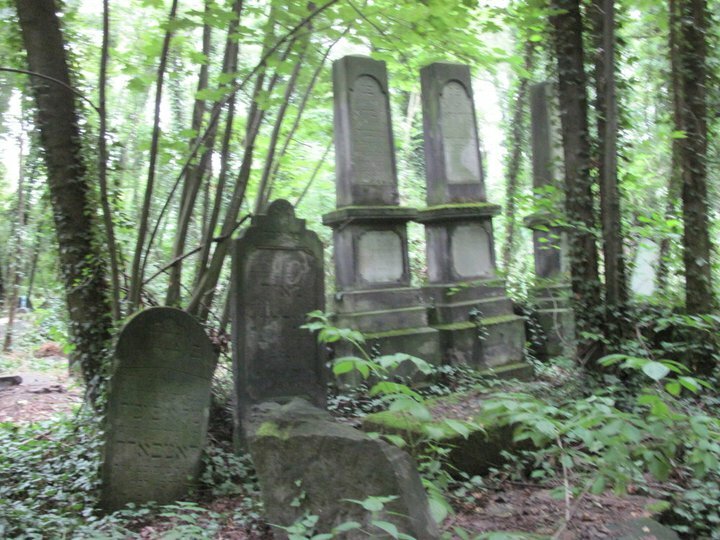 A million thank yous to Dina, her students, and their ongoing project to clean and catalogue Jewish cemeteries in Poland. The only thing I can think of to sum up is to say this: They are doing holy work, and anything anyone can do to help them is a profound mitzvah.